The number of girls taking STEM subjects are seriously low. No wonder there’s so few women in tech. 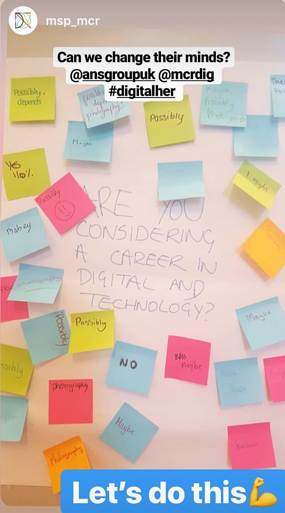 As part of our ANS Women in IT campaign, which aims to encourage more women to pursue careers in technology, we teamed up with Manchester Science Partnerships (MSP) and Manchester Digital on the third leg of their DigitalHER roadshow in Stockport. Sponsored by Manchester Science Partnerships, BJSS, GCHQ and Auto Trader UK the Digital Her Roadshow has been travelling through Greater Manchester with real life role models and engaging tech workshops for 12-13 year-old girls to break down the stereotypes of working in tech and the barriers many girls face when it comes to pursuing careers in technology. When we were asked by MSP to take part in this event, we jumped at the chance. We felt it was the perfect opportunity to engage with the Greater Manchester community and engage girls who may not have considered a career in technology. So on Tuesday 2nd April, we gathered some of our top female developers as well our communications team, Marketing Director and Talent Manager to show the girls just how amazing, inspiring and rewarding a career in technology can really be, as well as showing them the variety of skills and talents needed to fulfil roles across the tech sector. Of course, we’re biased, we think ANS is a brilliant place to work – whether you’re a man or a woman, there are equal opportunities for all. But DigitalHER isn’t just about talking about careers in the technology sector, it’s about encouraging young girls to exercise their creativity, innovation, problem solving and social skills. After all, that’s exactly what they are going to need in any role in the future! At ANS, we like to stay on trend, that’s why we chose to theme our whole workshop around increasingly popular chatbot technology. 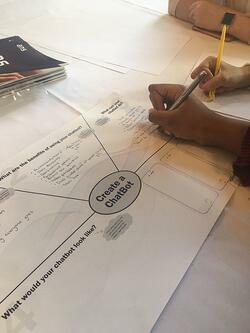 After giving the girls an insight how a chatbot is built (without frying their brains), we invited them to come up with some innovative use cases to explore how chatbots could be used to bring a whole load of benefits to their favourite brands, stores or any organisation they engage with regularly. We asked them to tell us why they had chosen that organisation, what their chatbot could do, how it would benefit customers and what their chatbot would look like. In doing this, the aim of the task was to get the students to realise just how much technology touches every part of our lives. By helping them to identify for themselves where technology could enhance their everyday lives, we hope to make them see how invaluable having digital skills will be to them in the future. This virtual assistant aids you in writing your homework where you can ask for advice, tips and recommendations - without actually doing your homework for you of course 😉. You can also share your work with your friends to share your knowledge and collaborate on homework pieces. This intuitive chatbot can offer you nutritional information so you know exactly what you’re eating before you tuck in. Or if dining out isn’t your thing, there’s also the option to get your meals delivered to your home and you can even track them in real time. The girls also came up with their own ordering system whereby you order your food only using emojis! You can ask ‘BlingBot’ where to find the bespoke, one-of-a-kind jewellery you always wanted. You can also request directions to your desired jewellery store as well as asking the chatbot to reserve the piece for you until you get there. Handy! This intelligent digital partner allows you to track buses in real time on a map, so you know exactly when your bus is on its way – no more waiting around in the cold! It can also send a notification to your parents when you step onto your bus, so they know when you are on your way home safely. Your very virtual personal assistant helps you find the right outfit while trying clothes on virtually from the comfort of your own home. It can offer you advice on the latest trends, styles and get you the best deals out there. Now this is something we can get behind! These are just some of the incredible ideas that the students created in a matter of minutes during our chatbot workshop. Who knew 12-year-olds could be so innovative?! It’s true that some of these ideas may have already been created, but what this shows is the girls’ ability to one day match the best of the best in the technology industry. And I think it’s safe to say we changed a few minds on the day! 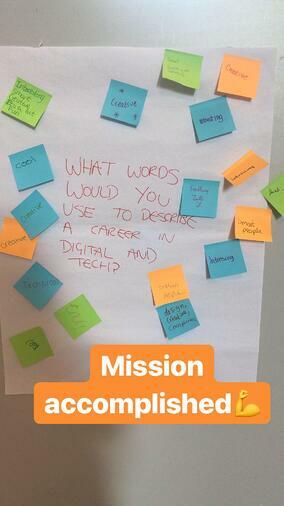 Before the workshops commenced the girls were asked to write down what words they associated with a career in technology, words such as ‘boring’ and ‘dull’ were being thrown about here and we were ready to change that! Afterwards, the girls were asked the same question and they responded quite differently (right), some girls changed their answers to ‘interesting’ and ‘inspiring’- mission accomplished we say! We are so grateful to have been invited to take part in the DigitalHER series and even though we were there to inspire and empower the young girls who attended DigitalHER, I think we were the ones who came away the most inspired. It was truly moving to see just how much future potential there is out there on our very own door step. We are so excited to find out what the future holds for such bright minds. To find out more about what we have planned this year as part of our Women in IT campaign, watch the interview with our Women in IT Ambassador, Beth Williams.